Thanks for your care about Excel Invoice Manager. Since August 4, 2013, Excel Invoice Manager was renamed to Invoice Manager for Excel (namely Uniform Invoice Software). Here is the version history of Invoice Manager for Excel (namely Uniform Invoice Software). If you are our existing user, we highly recommend you to upgrade to Invoice Manager for Excel (namely Uniform Invoice Software). Depending on when you purchased the license of Excel Invoice Manager, the upgrade might be free - if not, we offer great discount for you to upgrade from Excel Invoice Manager to Invoice Manager for Excel (namely Uniform Invoice Software). Excel Invoice Manager Platinum After August 5, 2012 Free. Upgrade to Invoice Manager for Excel (namely Uniform Invoice Software) Standard. 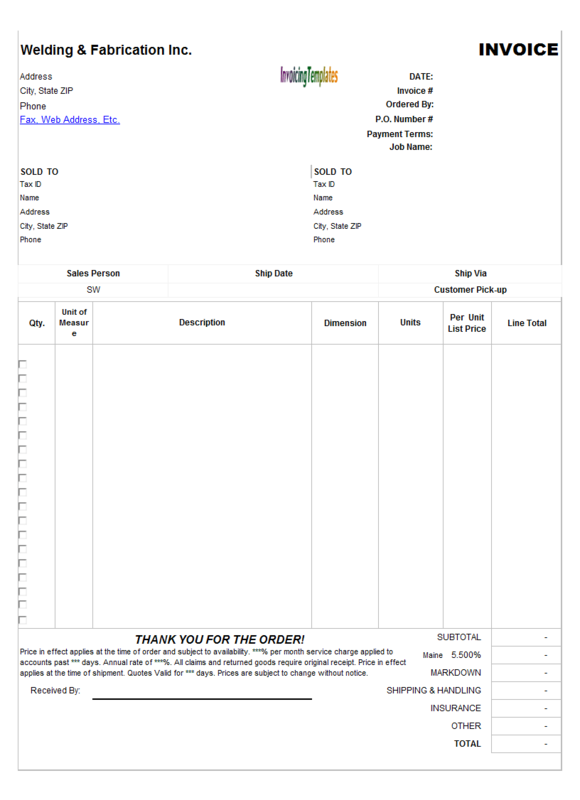 Excel Invoice Manager Enterprise After August 5, 2011 Free. Upgrade to Invoice Manager for Excel (namely Uniform Invoice Software) Enterprise. If your current licenses are within the above free upgrade plans, simply download and install Invoice Manager for Excel (namely Uniform Invoice Software). Your existing license key will work with this new version. If the free upgrade plans are not suitable for your current licenses of version 2.x of Excel Invoice Manager, get 60% off your new purchase of Invoice Manager for Excel (namely Uniform Invoice Software) by entering a coupon code into the shopping cart. We sent the 60% discount coupon code to the email address you used when purchasing our products. If you didn't get the coupon code, please contact us and provide your existing license key for Excel Invoice Manager, or use your email address used for purchasing when contacting us so that we're able to locate your original order details. We've made the required modifications to template and database files automated, so the upgrade process is straightforward. IMPORTANT: Backup your database and invoice template, by simply copying the two files to another location. 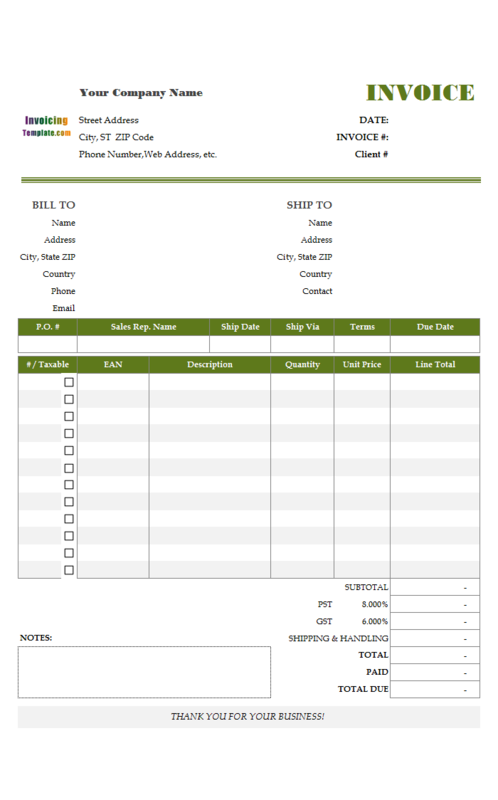 Download and install Invoice Manager for Excel (namely Uniform Invoice Software). 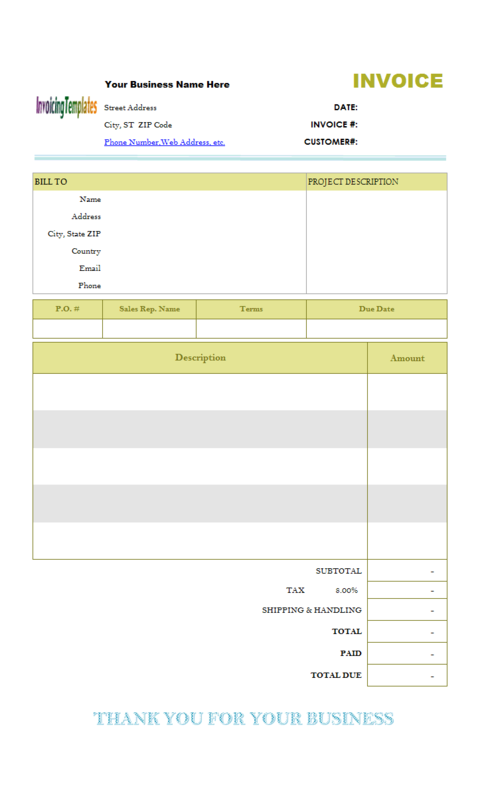 Open your invoice template. Invoice Manager for Excel (namely Uniform Invoice Software) will make modifications to your template and database to make them compatible with the new program. If, for some reason, you have to keep using Excel Invoice Manager, and need to download the installer program again, contact us for a link where you can download Excel Invoice Manager for free. Please provide us with your existing license key / registration code for Excel Invoice Manager. For those who want to keep using Excel Invoice Manager, here are some useful documents from office-kit.com. 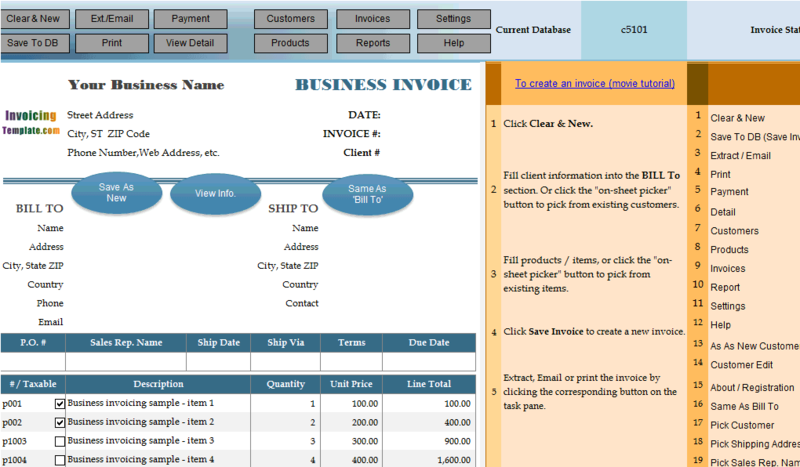 Excel Invoice Manager is a sub-topic of Excel Invoicing Templates . 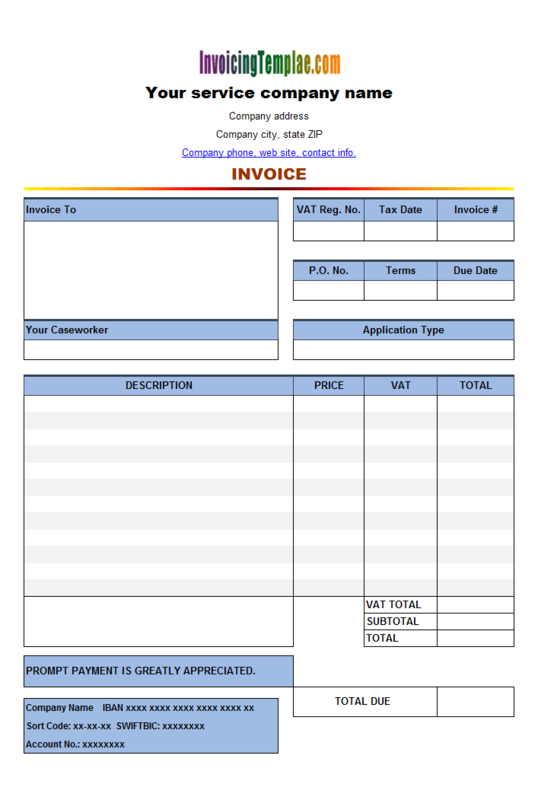 Here are our templates closely related to Excel Invoice Manager. 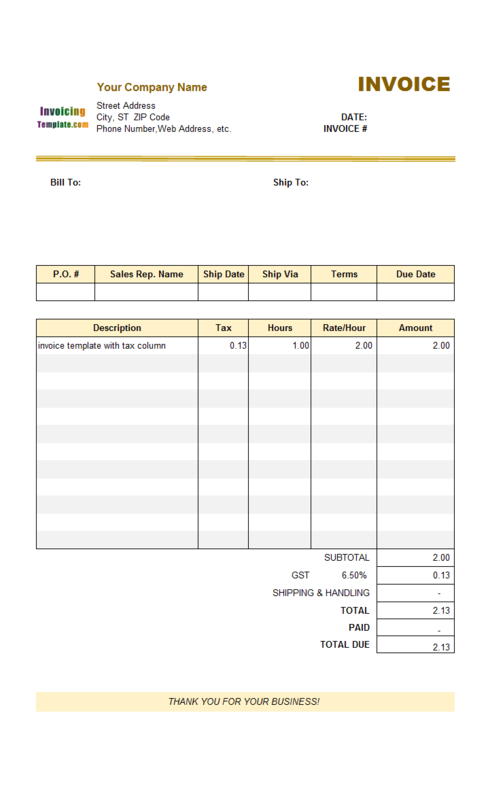 This Invoice Template with Tax Column includes both the "Bill To" and "Shipping To" sections and has 5 columns that are description, Tax, Hours, Rate/Hour, and Amount. 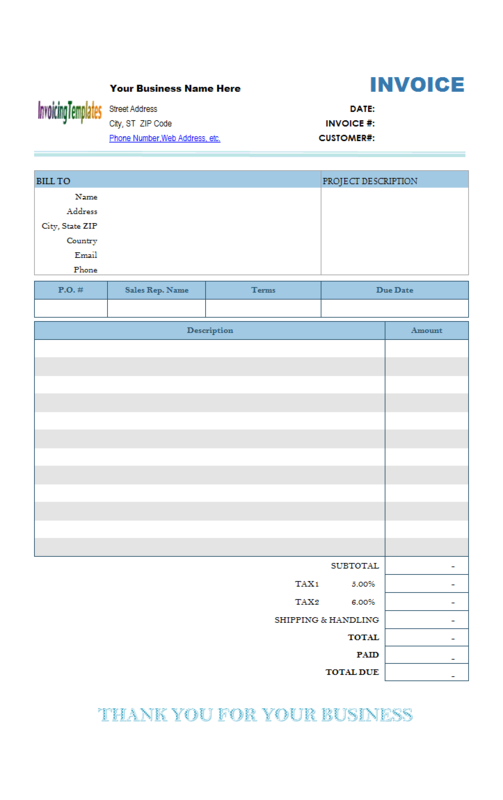 If you use the freeware edition of this invoice template, you may find there is no much difference between this invoice template and the default sales invoice template shipped with Invoice Manager for Excel. 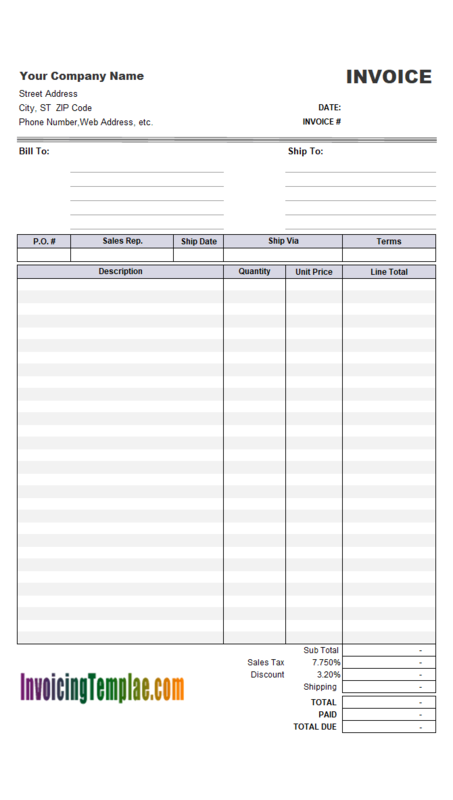 The only difference appears outside the printable area on the center of the form, where you can find a Product Category column near the invoice body. 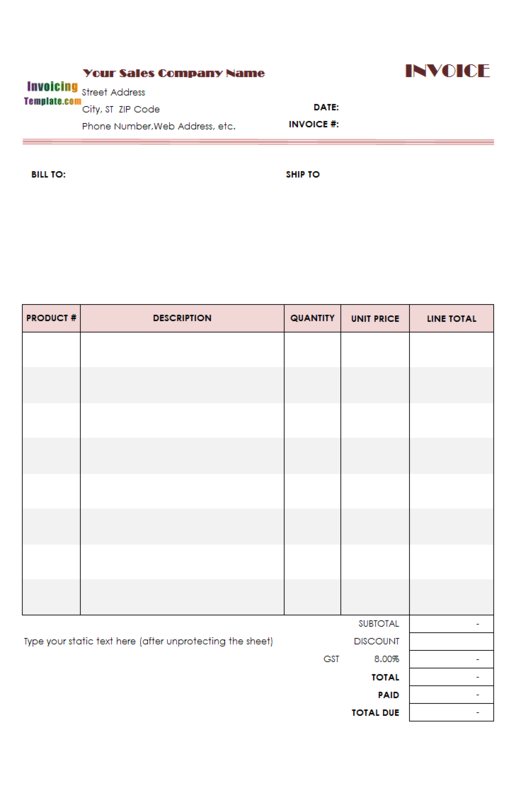 Visit the gallries at Simple Invoice Template and Blank Invoice Templates for more information. 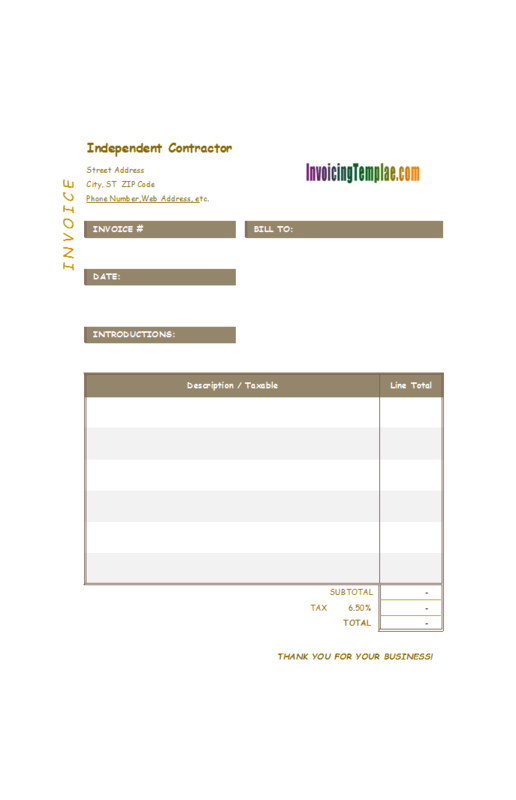 The template has one tax set on the bottom of the invoice form. If you have Invoice Manager for Excel (namely Uniform Invoice Software) installed, you can easily change it to two-tax or non-tax by clicking the Settings button on the Invoice worksheet, and then go to the Taxes tab. 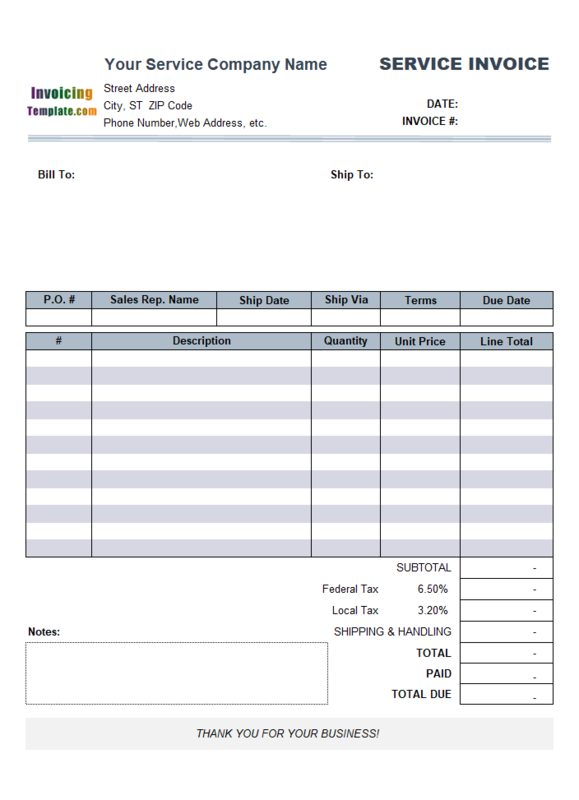 The discount level number of a customer and the discounted prices of the selected invoicing items, although appear on the invoice form when you create an invoice, they will not be included in the printed hard copy of an invoice or the extracted invoice that you sent to your customer. This happens because all these fields are placed outside the printable area, which is the area that will get printed when you issue the "Print" command in Excel. 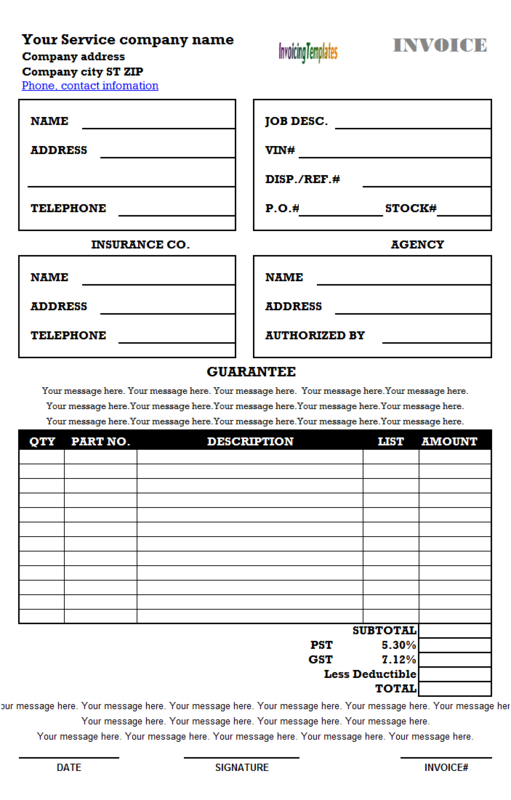 You can find more examples at blank invoice templates and printable invoice templates. 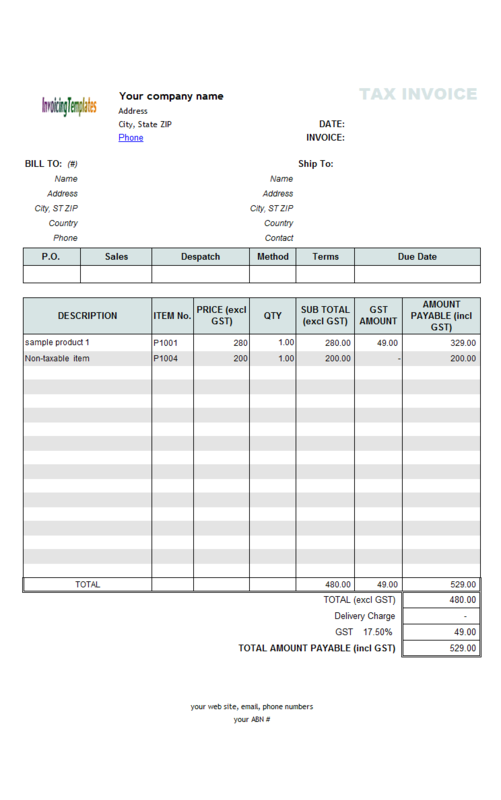 This two taxes invoice sample was created based on c2019 Blank Sales Invoice Format (One-tax). This customized template has similar layout as the original version, but differs from the original in that it has two taxes. 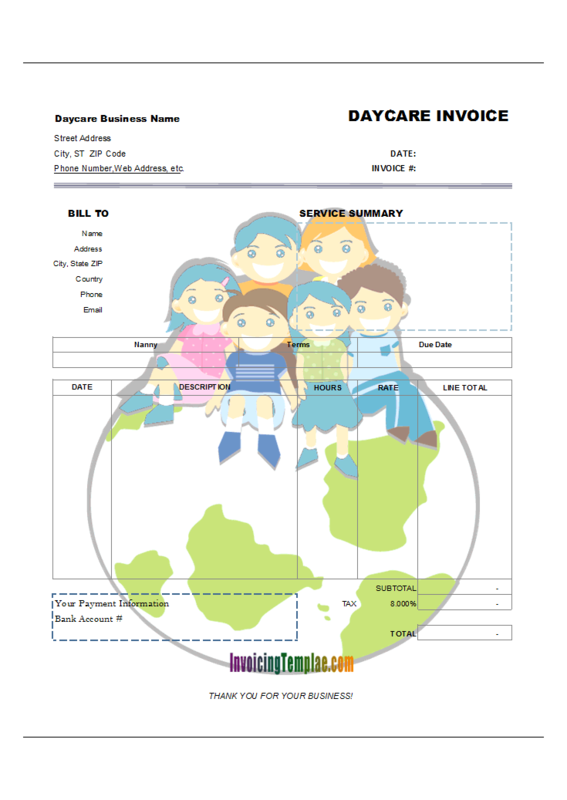 On revisiting the original daycare invoice template, we removed all the background settings for the range define by the "Print_Area" name. 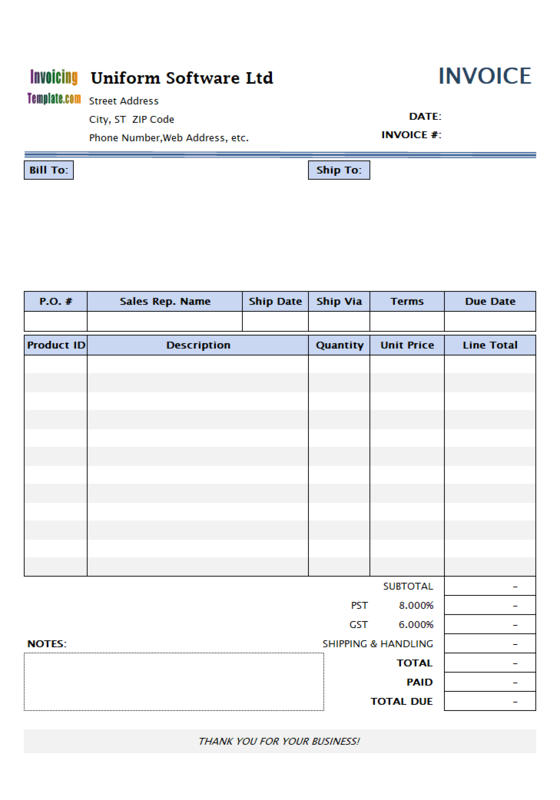 The "Print_Area" name is special name that defines what to print on a worksheet - we call this the printable invoice forms - if this cell name is missing from the worksheet, the whole worksheet is printed when you issue the "Print" command; otherwise, only the range included in the "Print_Area" definition is included. This template has one tax set by default, and the tax is assigned the name "TAX". You can change it to any name you like according to your business requirements and local economic design, such as VAT, GST. 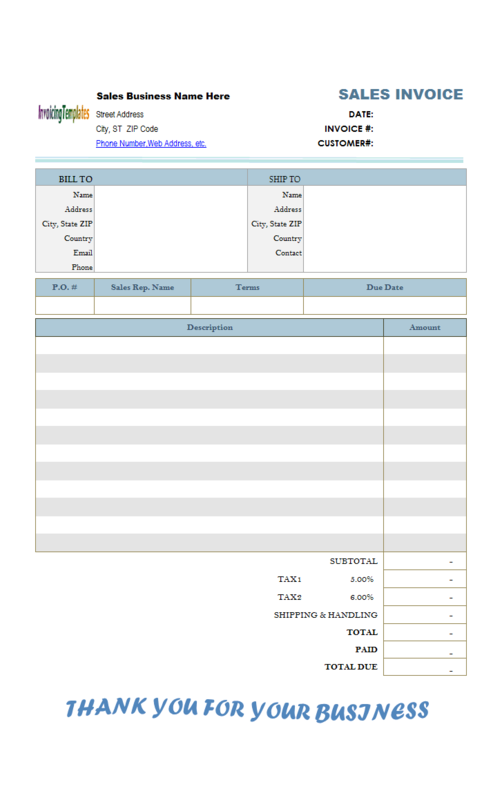 The tax name and rate can be changed directly after you unprotect the sheet. If you have Invoice Manager for Excel (namely Uniform Invoice Software) installed, changing tax name and rate is much simpler - you can done this by clicking the Settings button on the ribbon tab, and then go to the Taxes tab. With Invoice Manager for Excel (namely Uniform Invoice Software) installed, each time you click the "Clear & New" command, the tax name and rate are restored to the default values you set on the Taxes tab of the Settings window. Since our templates are in Microsoft Excel spreadsheet format (most of them are xlsx format). It is easy to do calculation using Excel formulas. This is one of the big advantages of Excel formatted template. 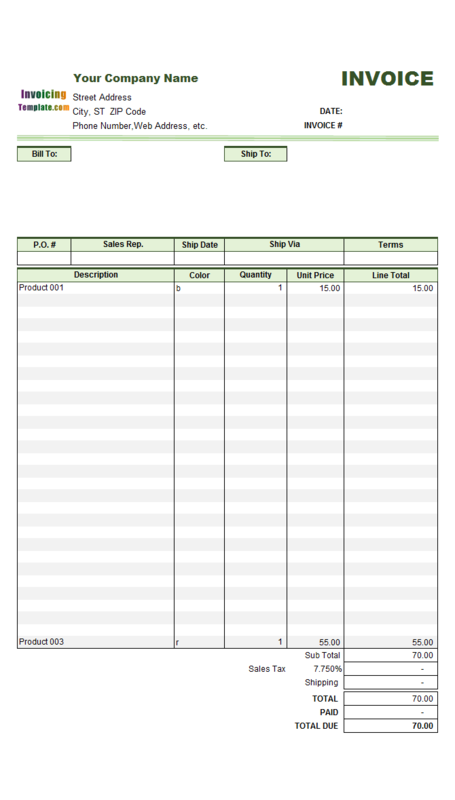 If you try to design an invoice template in Word format, doing calculations will not as easy as it is in Excel. 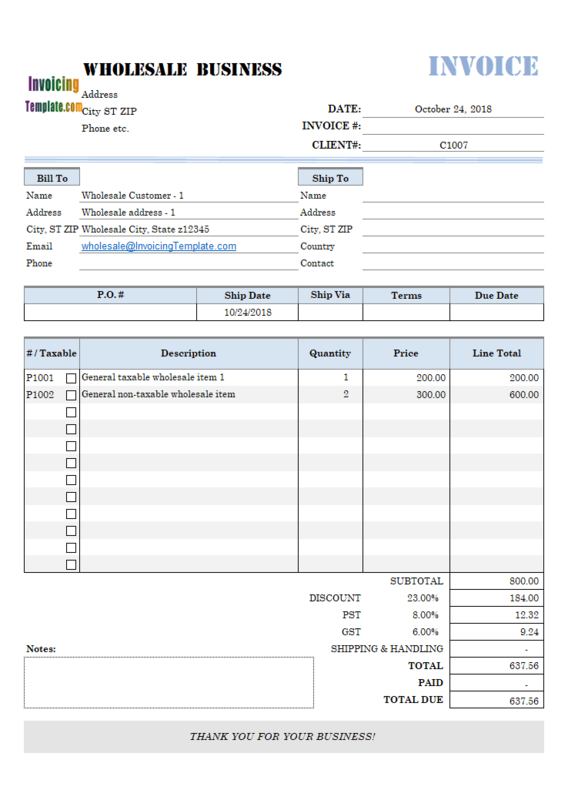 If you prefer OpenOffice.org, another popular office / productive system, they also have a number of sales invoice template sample. 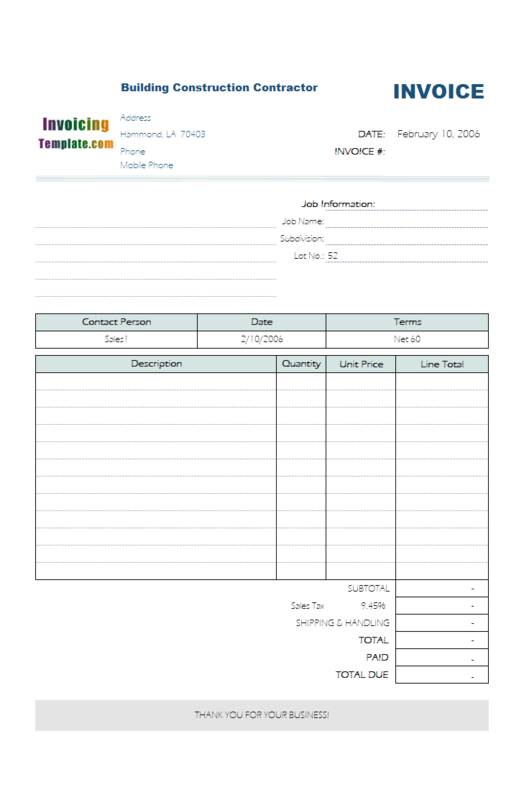 For example, with this sample template - Blank Sales Format (No-tax), we use Excel formulas for calculating subtotal and total. Note that with the default implementation, the "Payments" and "Balance Due" fields are put inside the Print_Area - the area that will be printed when you click the Print command in Invoice Manager for Excel (namely Uniform Invoice Software), or click Excel's own Print command. 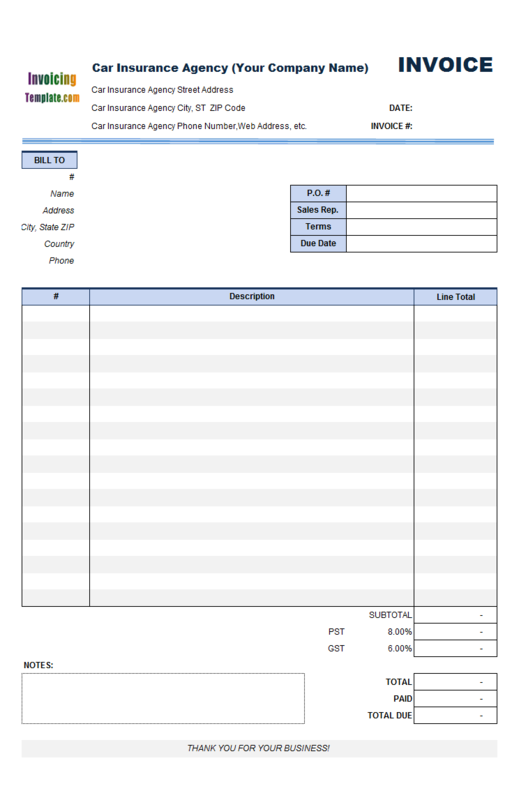 By utilizing the Print_Area name, we make this template more printer-friendly - and more printable. 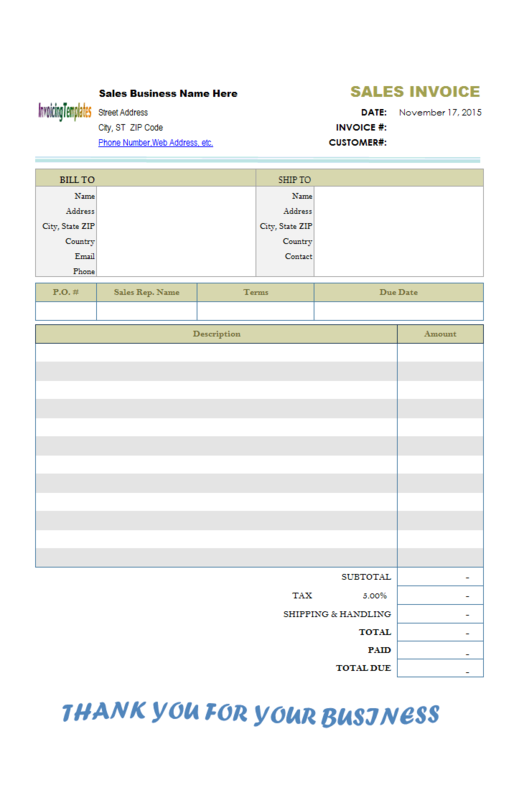 With the Simple Invoice Templates series we demonstrate how to do basic customizations on create and customizing your own bill format for your business, such as how to change fonts, move cells to create a new layout, change formulas to create a new business logic, etc. 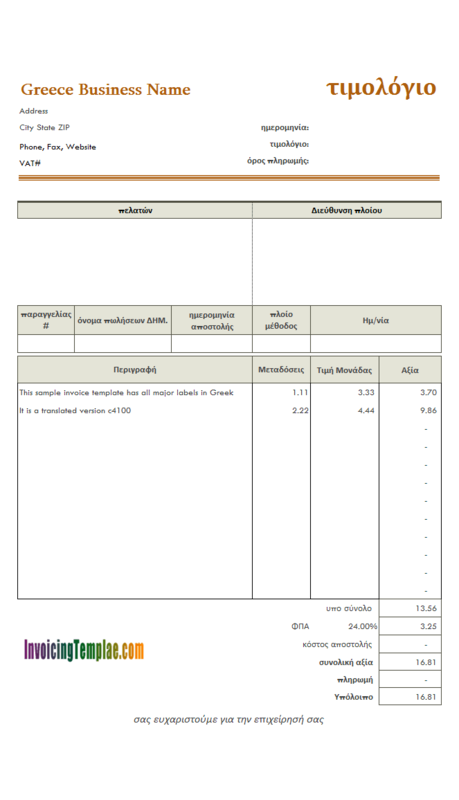 See this document to find out more information on the rules and guidelines on creating your own invoice template. 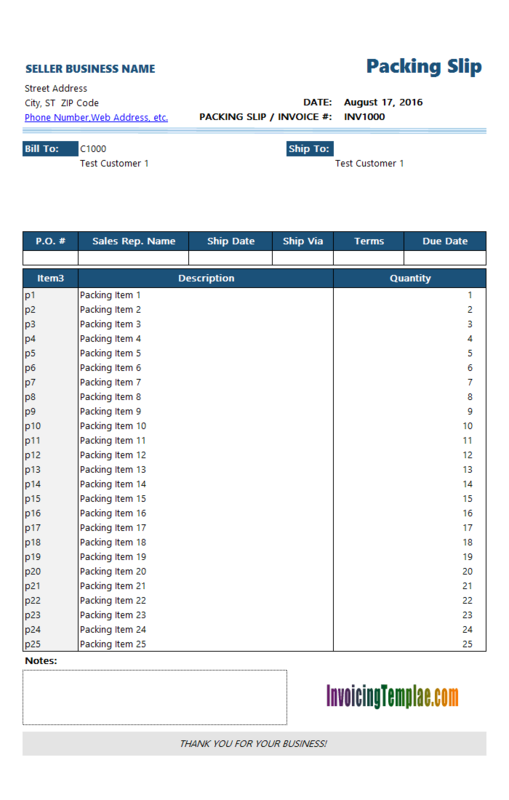 Just like adding a field to invoice header, adding a new column to invoice body involves two parts - adding a field to database tables, and naming the cells on the invoice body so that when you pick up a product or service, the custom field can be loaded into the named cells, and when you save an invoice, the named cells are saved into the corresponding database field. Outside the printable area, the two important columns are Broke Fee and Cost. With the Broke Fee column, you enter the gross revenue you expect, and the Cost column is calculated automatically based on Line Total and Broke Fee. This is done by using a simple Excel formula. Fifth, set the "Wrap text" property. Drag your mouse to select all the "Description" cells. Right-click one of the selected cell and choose "Properties". On the "Properties" dialog box, choose "Alignment" tab, and then check the "Wrap text" option.